The great leaders of our age set out goals that will make them better leaders. This will help them inspire themselves, their team, organization and the world at large. Creating a bigger legacy each year. 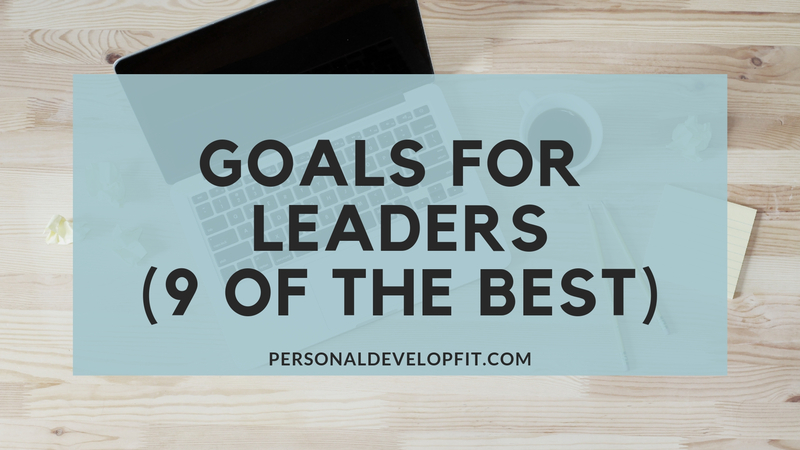 But what are good goals for leaders that will help us create bigger success? Below I offer you 10 different goals that you can implement into your life as well as a way to set goals in a way that will help better ensure your success! Meeting Like-Minded Individuals – You can create new business connections, like-minded friends and accountability partners. Relationships built here are on a higher frequency as people are seeking to improve themselves, which can be said for only a small number of the population. Jump-start Your Personal Development Game – Whether it is your first seminar or you are a seasoned vet, we can get inspired or re-inspired to crush our goals. Whether it be to start out the new year or give us motivation to fire us up to go hard at the end of the year. And anything in between. Up To Date Motivation – The personal development giants stay up on their game and will deliver the most current value that is able to connect and resonate with us right now. It will be exclusive and not found many other places. You will get the best tips and secrets at the live events that just aren’t available anywhere else. Switch Up Your Environment – We all reach a point where we feel very monotonous with our routine. We see the same people, sign the same contracts, go through the same motions. Going to a live seminar can put us in a new and electrifying environment and allow us to break up our routines. Goal Example: I commit to attending at least 2 personal development seminars that are either broad or niche related to develop my skills a well as give me extra motivation to achieve my goals. I do this because my income can only grow as much as I do. Les Brown talks about how we need to do things massively. We need to take massive action. If we are making 50 calls a day, we need to push ourselves to do 75 to 100. When it comes down to it, success is a numbers game. We need to push ourselves past the our self-imposed limits. Make it a point to start today to increase some variable in your professional life that will allow you to get out of your comfort zone by stretching you. This tip, although seeming very obvious, call allow us to double and triple our productivity, numbers, success levels as well as develop a sense of inner power that is unshakable. I myself have been victim to trying to do it all, which as leaders and entrepreneurs we want to do so. But if we learn to assign and delegate the mirco-tasks to others, we can focus on what we need to get done that will help further our big goals, vision and legacy. If you have trouble doing so like me start with something small you can delegate that won’t mean much. This will help us learn the power of delegation and see how it does free you up, both mentally and physically, freeing up vital energy. Picking The Right People – Hire people who you have confidence in and who you see as self-motivated and consistent as well as are comfortable working alone and without supervision. Clear Communication – Being straight forward right out of the gate, it is essential. Be up-front about your exact expectations. The person we are delegating our tasks to can’t read our minds. We need to lay out what we want, how we want it and when and in a style that is conducive to how we get things done. Check In – Check in enough to make sure the task is on track and to your liking, but not too much to where you aren’t harnessing the power of delegation. Patience – There will be a lot of questions that need to be answered at first, just be patient with the individual or group you are delegating tasks to. The questions will lessen once they get to know you needs and demands. Giving Credit – Recognition is key. Making sure they look good and are given credit is crucial to retaining them as someone to delegate your projects to, along with having them work hard for you. Goal Example: I will use the power of delegation to allow myself to get more done. I commit to finding the best team to delegate to that will put me at mental ease that these tasks will get done to my liking. Over the next month, I will have developed this team of delegaters and implement tasks to them whenever need be. Listening to our team and people around us can be crucial to creating better and more profitable relationships. I created an article on how to listen – the 11 characteristics of a good listener as a guide to help us all listen better to better influence our prospects and the people around us. Goal Example: I commit to listening more when I have the urge to talk. I commit to digesting things people say to me and formulating a response based off what they said rather than just what I want to say. No one does it alone. Tiger Woods has a coach and mentor. The most successful people in life use mentors in all areas of their life to maximize their full potential. Start by taking stock and honing in on your true strengths and weaknesses which will help you decide where you need to grow and learn the most. Also think about what type of mentor would work best for your particular personality. A great article called 8 steps to getting the perfect mentor for you, talking about how they should offer you career guidance along with emotional support as well. They should also play the role of being a role model offering you something to aspire to. It can be tough to find a mentor though our personal circle though as most of us aren’t that luck. The article talks about how to go about contacting and picking up a good mentor. When reaching out to a potential mentor, the article suggests that for example you shoot an email to them and create some sort of common ground. A similarity between you two that is similar but not super obvious. The article refers to them as uncommon, commonalities. Things that not everybody can embody, something deeper that is more personal. Lastly, don’t use the word mentor in your email to try to secure the person as your mentor. This is just an unwritten rule. Sprinkle in some flattery, clarify your connection, be polite but blunt enough to get your point across, show that you have done your part in obtaining as much knowledge as you can and then spellcheck the email and send that baby out. Once you lock down a good mentor, do all you can to find answers of your own first. Only contact them when you really need them most. This will show that you have the utmost respect for their time. Goal Example: I commit to finding a mentor in at least one area of my life that I want to turn the volume up in. I do this because I realize that power of mentoring and know I can only reach my full potential with it. Routinely explore internal trends. What are the issues that are getting raised again and again within your organization? How can you be more proactive in the connection with your peers about talking about your findings in of trends in your network? Ask The Tough Questions – For example, how do you now broaden what you have considered about internal trends? Cultivating curiousity by looking at information coming from different points of view, you can see different approaches, possibilities and outcomes. Learning how to speak soundly – Learning how to convey our message with proper verbal and written communication is key. They get people to bring up underlying assumptions and properly walk people through the process of the identification of issues. You can do this by presenting your answer first, not building up to it. Also priming your audience can be done by giving them a heads up on overarching tops which will prepare them to create a higher level of conversation. Goal Example: I embrace the power of strategic thinking by implementing tactics that help me do so in a more effective way that will evoke better answers from my team as well as myself. Saying No More Often – Declining opportunities that you don’t truly care about or really have time for can open up much more time to devote to things that you do. Don’t Sweat The Small Stuff – Push past the inherent dsire to push past wanting to always examine what you have done so far. Get the bulk of the project done and revise things when you are done. Creating A Time Limit – Creating time blocks to where you work on things instead of just trying to bang the whole project out can allow you to tap into more creative thinking. Create small gaps of down time between work to recharge. Ignorance Is Bliss – Don’t dwell on your to do list or let it overwhelm you. Simply focus on one thing at at time and move forward. Organize – Create systems that allow everything to stay organized. Take some time out to create filing systems, unsubscribe from email lists that provide you no value. This will create less stress and allow you to focus on your work more efficiently. Advocate Communication Between Departments: Implementing a two-way system of communication with a lower level department to have multiple departments working together to achieve common goals. You can also switch up employees roles where you rotate employees to work in a different area then the usually do which can create empathy in the organization by stepping in someone else’s shoes. Set Up Town Hall Meetings – This can be done either quarterly or monthly where all hands are on deck and everyone is able to input their suggestions for improvement. It will give everyone a chance to be transparent and know what problems each department is facing so they can give input. It creates a judgement free environment for the whole organization. Encourage Social Collaboration – Creating social bonds within the company will break down peoples walls and allow collaboration throughout the entire organization. This can be done by setting up actual social meet ups or creating them in the work place, like with multiple snack and coffee zones. Swap our the big and awkward desk in the conference room with smaller tables so that you can create a vibe where multiple small groups can meet all at once. Goal Example – I harness the power of creating internal collaboration within my organization through social events and professional events to break downs walls that can be keeping my team from sharing their best ideas. Metics – Measuring things like talent distribution where you track your talent distribution to see, for example, if the average age of your talent is increasing which you can shift recruitment efforts to attracting that age group. Or the metric of time to hire, where you measure the gap of time between tje vacancy in the organization to when someone new is hired. This can help you hone in on ways to make this time gap shorter. The Competition – How can your organization outshine and outperform your competition to make you look more attractive to incoming star performers? What Areas Do You Want To Focus On? – Do you want to be known as a place to that treats you employees better than anyone else that attracts all types of backgrounds? You can do this by creating a culture that treats their employees ten times better than they do their customers. Goal Example: I see the power of talent management and implement in at a higher level throughout my organization so we can retain our best talent as well as attract the best of the best out there to our team. Define 3-5 key objectives that are ambitious, time bound as well as actionable by everyone on the team. Under each of these specific objectives, there should be 3-4 measurable results. They should be achievable, quantifiable, difficult but not impossible. These are usually based off of performance, growth or revenue. Once these variables are created relay your message to all stakeholders to ensure they understand them. When the team starts working, they update their result indicators often, weekly is great. An objective should be considered done when it reaches a completion level of 75 percent. If the team hits full completion of the objection, than it simply isn’t ambitious enough. OKR’s should keep the focus and productivity and a higher level than ever. Now I feel like there is definitely some wiggle room with these goals, like setting a realistic goal should be seen as something that is going to stretch us but still we can achieve in a timely manner and then immediately set a bigger and more challenging goal. They should be challenging goals that are inspiring and are just within your reaching but won’t leave you frustrated with being a little to outlandish. Deadlines (timely) are so crucial as it will give you a sense of urgency. Write down your goals – Keep them visible with you each day, both long-term and more importantly your short term goals, like daily goals that will keep you on track and accountable. Action Plan – Create individual steps that lead you from A-Z but have all the other letters in there as well. Create a road map as flawlessly as possible. While you are pursuing them, seek advice from peers, a mentor, former partners to get insight on elements you may be missing. Trust Your Instincts – After you have created a plan of execution, utilize it to a tee without much deviation as it is tempting to keep switching things up and creating new plans. Don’t get ahead of yourself, focus on the long-term vision but doing so by crushing it with good daily habits. Also write down why these goals are valuable to you. This can be a huge factor in creating the motivation you need to achieve that particular goal. Next, take massive action and adjust yourself along the way, honing in your trajectory until you gain massive momentum towards your goal. So there we are my friends, 9 goals for leaders and how to use OKR and SMART goals to put your team on the fast track to accomplishing bigger numbers and staying focused. Share with me what your favorite tools were that you are excited to implement as well as if you have anything to add. Have a great day my friends.